Twycross Zoo is celebrating the birth of a critically endangered Western lowland gorilla (Gorilla gorilla gorilla). The baby, who has yet to be named, was born on 24 September and is the third baby for 22-year-old mother Ozala and 24-year-old father Oumbi. As well as being a joyous occasion for zoo staff and visitors, the birth is an important part of conservation efforts to save the species, as the number of Western lowland gorillas in the wild has dramatically declined by more than 60% in the last 20-25 years, and scientists predict they will become extinct in the next 20 years or so. Western lowland gorillas live in the dense and remote rainforests and swamps of Central Africa. However, humans are encroaching on their natural habitat, clearing forests for timber, oil and gas development, as well as mining. The illegal pet trade and poaching for bushmeat sold in markets and smuggled out of Africa also threaten the species. As well as managing captive breeding programmes to ensure the future survival of endangered species such as gorillas, Twycross Zoo also supports research on primate health and well-being, such as the Ape Heart Project with the University of Nottingham, as well as field projects and organisations which focus on the conservation and protection of endangered species and their habitat in the wild. One such organisation is Ape Action Africa in Cameroon, a forest sanctuary which is home to around 140 rescued and orphaned great apes, as well as monkeys. Internationally renowned wildlife vet Dr Sharon Redrobe, CEO of Twycross Zoo and Chair of Trustees for Ape Action Africa, regularly visits the sanctuary to administer health checks and, when required, carry out specialist veterinary surgery. 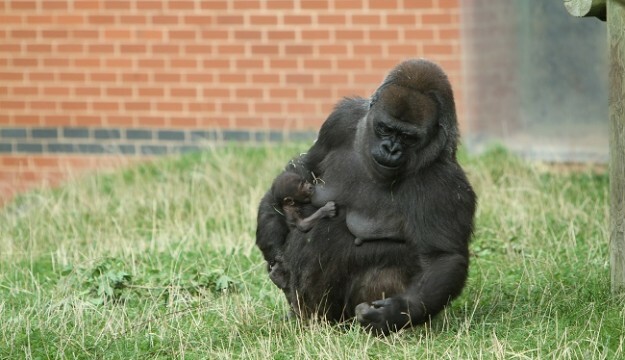 Dr Charlotte Macdonald, Director of Life Sciences at Twycross Zoo said: “We are very excited about the arrival of this healthy newborn baby which is a boost for the future of this threatened species. We hope lots of visitors will come to see the baby and its family and learn more about gorillas. This announcement follows the birth of two Amur cubs, the world’s rarest big cat, at the zoo in June.